The end of financial year almost always means discounts and sales, and this year was no different. My favourite shop, element14, had run some promotions in their Connect magazine, which included a further discount of 10% on the already-discounted prices provided you entered a promotional code into your basket. That, combined with a student account discount, meant that I could buy some Wi-Pi wireless adapters for AU$8.294 inclusive of GST. I thought that was pretty cheap, so I went ahead and grabbed a bucketload of them for my own purposes. 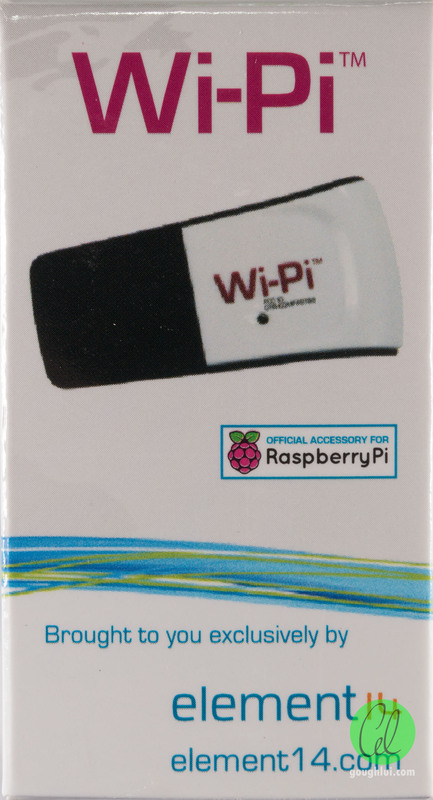 The Wi-Pi is a basic low-cost wireless adapter marketed at the Raspberry Pi user. 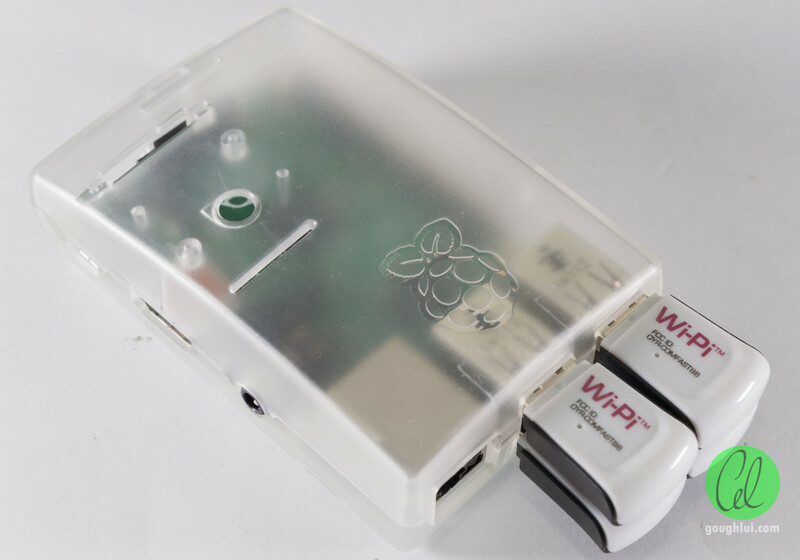 The main attraction is the confirmed compatibility of the product with the Raspberry Pi. Aside from that, there really isn’t anything to write home about, as it is a 2.4Ghz single-band single-stream 802.11n adapter, claiming 150Mbit/s (40Mhz mode) link rate. Of course, that’s what you would expect at the price it sells for, and it’s still fast enough for most uses. 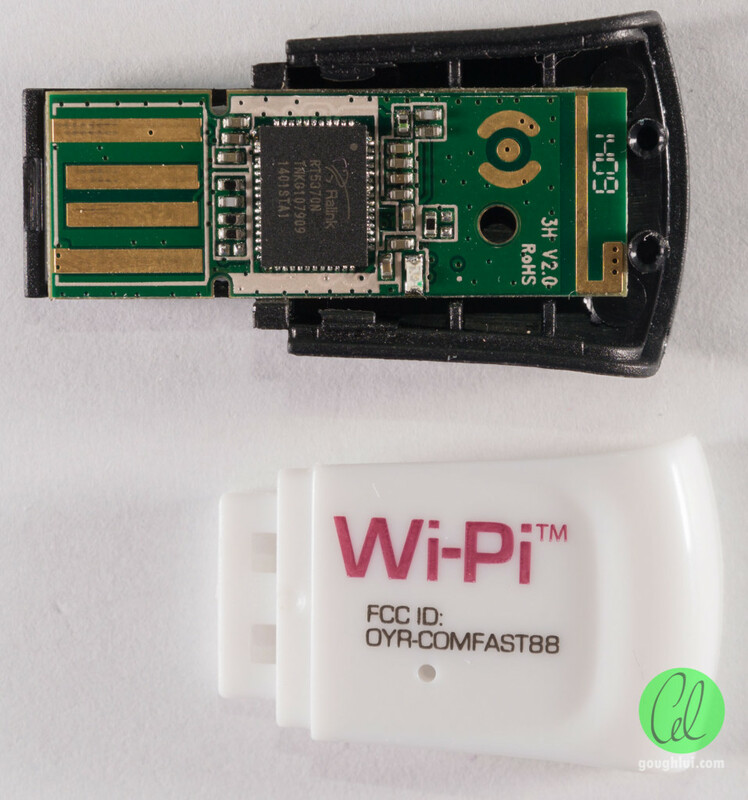 It’s important to remember, this is just a USB wireless adapter, and aside from the Wi-Pi branding, there isn’t really much to distinguish it from another. As a result, you can definitely use the Wi-Pi adapter with your computer as well, should you need a second 2.4Ghz only Wi-Fi adapter. Inside the box is a relatively “upbeat” user manual, which isn’t really necessary for most users. Of course, then there is the unit itself. The unit is relatively small, but not so small as the latest “mini” leave-and-forget models. It comes with a cap which can be removed (and easily lost). It has a hole in its casing for an activity LED to shine through. According to FCC documents, the ID of OYR-COMFAST88 belongs to Shenzhen Four Seas Global Link Network Technology Co., Ltd, who are likely the manufacturer of this product. The test showed that the product’s transmission power was measured at 11 to 12.1mW (which is less than the 20dBm claimed on the box). I suppose that’s not necessarily a bad thing, as it might mean a lower power consumption, which would be good if you were powering your Raspberry Pi on a battery. Despite its larger size, it doesn’t obstruct adjacent USB connections, so you can do this, even though it is not advisable. This device doesn’t use a regular USB shell, and instead uses a special shell which holds the case together. The USB shell has to be slid off, before the rear plastic halves can be separated to reveal the PCB which forms the USB contacts as well. This method of connection is slightly less reliable (due to the flat profile of printed traces) than a real USB connector. The PCB is dated Week 9 of 2014, making this relatively old stock. The adapter utilizes a single-chip design based on a Ralink RT5370N, itself dated Week 1 of 2014. Other adapters using this chipset include these. The underside features mostly surface mount capacitors, inductors, a crystal and some regulators. The antenna is a printed trace at the end of the board, which is less efficient than a larger antenna or special chip-antenna, but lower cost. I don’t expect stellar sensitivity or long range performance from this type of design. Under Windows, it is possible to use this adapter provided you install the Mediatek drivers for USB. This might seem strange, but Ralink was acquired by Mediatek a while back, so they no longer distribute drivers even for their own chipsets. Under Linux, it is pretty much plug and play with most version 3.0 kernels and above having baked in support for this adapter. 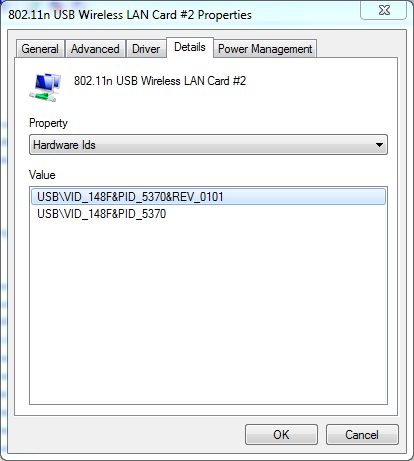 Those that don’t can probably use rt2800usb or rt5370sta drivers. In my testing with my WPA2 network and sending large flood pings which utilize the full network rate, each adapter consumed about 140mA according to the USB Charger Doctors. This is quite low, compared to older adapters such as the Netgear WG311v3 which I previously used which easily consumes over 360mA under such loads. This is the benefit of newer, single-chip designs utilizing new mixed-signal designs and process nodes. This means that even if you were to go crazy and stuff every port with a Wi-Pi, you would not run afoul of the current limiter on a Model B+, and you might be right on the limit with a Pi2 Model B. The printed antenna on the board is on par with the micro adapters which are “plug and forget” designs, but it seems that the sensitivity to signals is below that of most of my tablets and phones which can see more networks. 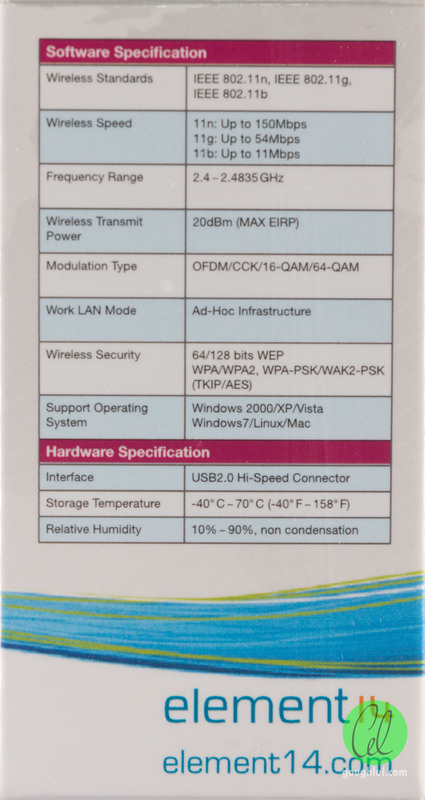 It is also less sensitive than my favourite Atheros-based Raspberry-Pi compatible TP-Link TL-WN722N with external antenna, so it is not suited for long-distance work. It is still sufficient for “in house” usage and experimentation. The unit isn’t as small as some of the micro adapters, and it doesn’t have any fancy bells and whistles, but it is very affordable and does the job with a relatively economical power consumption. 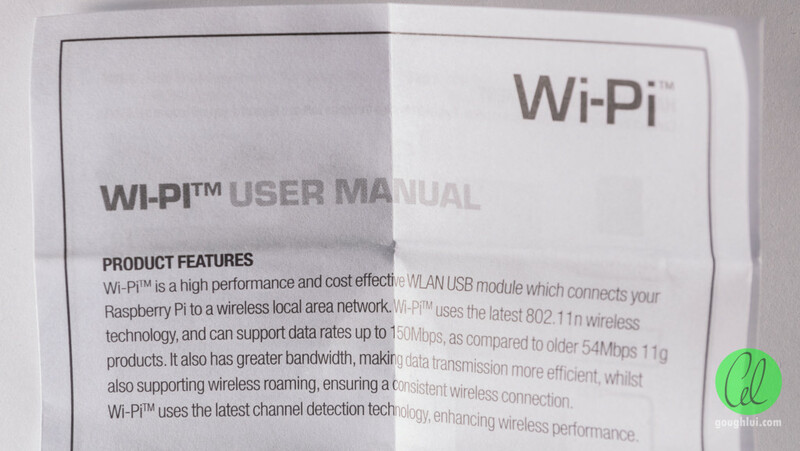 Best of all, it doesn’t obstruct any adjacent ports, which many of the larger wireless adapters are guilty of doing. It’s a good device to have on hand “just in case”. This entry was posted in Computing, Raspberry Pi, Telecommunications and tagged computer hardware, element14, networking, raspberry pi, review, teardown, wireless. Bookmark the permalink.